I have stated elsewhere that Stained Glass from Welsh Churches was not intended as a book of the best stained glass in Wales (and said as much on p. 7 of the introduction). In his review of the book recently published in the Journal of Stained Glass (vol. 38), Peter Cormack goes further, noting the ‘number of feeble or positively dire examples’ that I troubled to include from the later nineteenth and twentieth century, which potentially reinforces a negative view of stained glass that persists among many people. However, negativity, or at least indifference, towards the medium seems more characteristic of art historians than of people in general in my experience. He also claims that the work illustrated reflects ‘the relative poverty of Wales’, and I wonder whether such a claim would have been made if the book had focussed more on high-class works such as big east windows during the same period by Clayton & Bell, Hardman’s, Powell’s and Burlison & Grylls. In the previous post I quoted another reviewer who commended the ‘even-handedness’ of an inclusive approach to stained glass, and Peter Cormack also praises the inclusion of work by many provincial firms, ‘often for the first time’, in addition to those that are better known. In fact he goes as far as to say that ‘it would be difficult to think of a book that might be more useful to groups such as NADFAS Church Recorders in introducing them to the vast subject of Vicorian and later glass.’ High praise indeed. There are certainly windows in the book that are poor but which demonstrated something I wanted to convey, and there are others that I couldn’t bring myself to include. There are certainly several in the chapter on late nineteenth-century memorial windows and saddest of all is perhaps the Good Shepherd by A. Seward & Co. of Lancaster which was included to point up the originality of the work of Mary Lowndes and (particularly) Edward Woore in the following chapter on the Arts and Crafts Movement. But my choice of themes for certain chapters was deliberately chosen to include work by lesser known makers, good and bad. Somewhere there will be a window by Seward & Co. that is genuinely cherished by a congregation unaware of my opinions or those of Peter Cormack. They would be probably be interested to know more about the maker and about other windows that the studio made, and these people need books about stained glass as well as art historians primarily interested, for good reasons, in the best that our culture has produced. There is also another reason why the photograph of the Good Shepherd by Seward & Co. was chosen for the book. It is in a church that has long been closed and may never be accessible to the public again, if indeed it survives. The review in the Journal of Stained Glass is followed by another positive review of my little book on the stained glass at the Church of St Mary, Tenby, which adds some further useful detail on the architect J.D. Coleridge, who advised the rector on the commissioning of Karl Parsons. Interestingly, Peter Cormack notes the probability that Edward Woore assisted Karl Parsons with the war memorial window at Tenby. Reviews of Stained Glass in Welsh Churches have recently appeared in two Welsh journals, the county journal Ceredigion and Archaeologia Cambrensis, the journal of the Cambrian Archaeological Association that was first published in the 1840s. Writing in Ceredigion (vol. 18, no. 2, 2014), Elizabeth New also reviews my little book on the stained glass at Llanfihangel Genau’r Glyn, published in 2013, since the church is in the county, located a few miles north of Aberystwyth. Her review appropriately notes examples from Ceredigion throughout her summary of the chapters and her ‘minor quibbles’ perhaps suggest some of the things that others might have hoped to find in the book, For example, she notes that I did not write much about the ‘extent of the loss of medieval glass, particularly through deliberate destruction’. In fact I think that I noted every reference to destruction of medieval glass in Wales that I came across, all of which were at the time of the Civil War, and none of which were in the sixteenth century. This surprised me and I would be very interested to learn of examples of the destruction of stained glass in Wales by Protestant reformers in the sixteenth century. To write about the extent of the loss of medieval stained glass in a county such as Ceredigion would rely on pure speculation. Elsewhere she notes that I do not comment on the use of the Welsh language in inscriptions, a subject on which I could write an interesting chapter but for which I simply did not have the space in the book or the leisure to research in more detail. It’s not unimportant, but this is a book about visual art. Along with the theme of the memorial window, which she notes recurring throughout the book, such things would be fruitful areas of new research. I found it curious that she commends the layout as ‘user-friendly’: a term that we used to use in multimedia design in the 1990s, and therefore seems odd to me as a description of the printed page. But I hope that the book is indeed user-friendly. Julian Orbach captures the essence of what the book tries to do in his review published in Archaeologia Cambrensis (vol 163, 2014). Noting my involvement in the ‘Visual Culture of Wales’ and ‘Imaging the Bible in Wales’ projects, both of which ‘stepped outside art-historical judgement’ and took an inclusive approach, he notes that this ‘even-handedness gives place for glass that has fallen thoroughly from fashion’, both in the nineteenth and twentieth centuries. At the same time, some of the less inspired windows that I have illustrated contrast well with the best, and his list of windows by Leonard Walker, Richard Stubington, Karl Parsons, Harry Clarke Studios, Martin Travers and Wilhelmina Geddes more or less sums up the best of the best in my view. Julian Orbach’s own contribution to the study is not inconsiderable, having contributed to volumes of the ‘Buildings of Wales’ series, and those of the series that are most informative on stained glass are those on which he worked. He was also very generous in sharing his notes on stained glass in Wales with me some years ago. 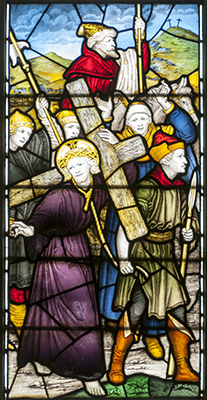 He concludes the review by describing the book as ‘the best survey of stained glass published anywhere in Britain’. On all counts, my thanks to him. The Garden Window: Stained Glass From Welsh Churches. The Friends of Friendless Churches take a small number of redundant churches into their care. About half of their churches are in Wales, and a recent vesting is the Church of St Michael, Castlemartin, Pembrokeshire. Among the stained glass at the church is the best example of a window designed by A.W.N. Pugin for a church in Wales, so I was pleased to learn that the Friends were interested in taking the building into their care. The church also has some fine medieval features, including some remarkable twelfth-century corbels and font. Included in the book, my photo of the window was used on the cover of the Autumn Newsletter of the Ancient Monuments Society, which is published in association with the Friends of Friendless Churches. The close up unfortunately reveals the loss of paint on parts of the window, although this loss is worse on the windows on the north side of the church, which were also probably made by John Hardman & Co. Not illustrated in the book, they are on the Stained Glass in Wales Catalogue, and St Peter is illustrated here.